Desktop version of the VS-100 Vectorscope with traditional button access to the different modes (unlike rotary dial on the pocket size VS-100). With HD/SD SDI inputs, it can test feeds in a large number of formats, from 576i and 720 50p to 1080i and 1080 25p. 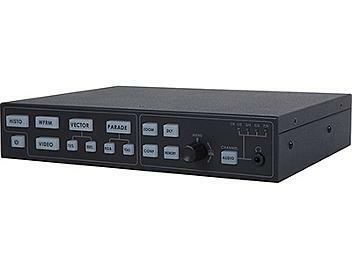 With HDMI outputs, it can be used with cost-effective HD monitors while its SDI ports can be set up as a loop-through as part of the production technology chain. The unit is 1RU high and 1/2 rack wide.